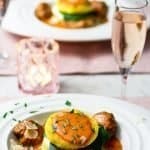 Polenta Mozzarella Stacks with Rosa Sauce for Date Night!Polenta Mozzarella Stacks with Rosa Sauce for Date Night! Want a romantic dinner for Valentine’s Day but want to skip the reservations? These Polenta Mozzarella Stacks are an easy way to WOW your date and your taste buds! If using dry polenta, cook according to instructions, cool, and cut into 3 inch round discs. Heat oil in a pan, sear the polenta rounds on each side. Keep warm in the oven while you make the meatballs. Combine meats, spices, and egg in a mixing bowl. Scoop or roll into 1.5 inch meatballs. In the pan you cooked the polenta rounds in, sear the meatballs. In the skillet where you seared the meatballs, combine the Bertolli® Organic Traditional Tomato & Basil Sauce and the Bertolli® Organic Creamy Alfredo Sauce. Add the meatballs and let the flavors combine until the meatballs are cooked all the way through. On each plate, add a heaping ladle of Rosa Sauce. Top with a slice of mozzarella and a few spinach leaves. Top with another round of layers, ending with one more polenta round on top. Spoon some more Rosa Sauce on the top. Add a few meatballs around the edge.